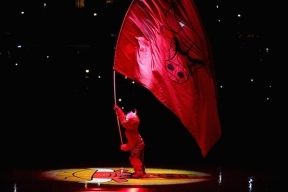 The Chicago Bulls announced plans to commemorate 50 years of Chicago Bulls basketball throughout the 2015-16 season. “Chicago Basketball is Golden” will serve as the season-long theme and the team will engage fans through a variety of activities honoring the 50th season of Chicago Bulls basketball at games, as well as through a new TV commercial campaign, community and grassroots events, during game broadcasts, and on Bulls.com and through Bulls social media channels. The Bulls will celebrate the team’s 50th birthday, as well as 80’s Night, at home on Wednesday, January 20 vs. the Golden State Warriors. The team will celebrate 50 years of giving back to the community through “50 Community Contributions”. Throughout the season, the team will hold 50 events and initiatives that reflect the team’s tradition of philanthropy. The 50th season will also be incorporated into this year’s team charity gala, An Evening with the Chicago Bulls, on October 16th. Fans can be a part of the 50th season festivities by sharing their favorite Bulls memories on Twitter, Facebook and Instagram using “#Bulls50”. These stories will be aggregated on a new “50 Years of Fans” page that highlights and thanks the best fans in the NBA for their continued loyalty.